Walk in the steps of World War Two veterans and the traditional people of Torres Strait with the multi award-winning Torres Strait Heritage, a fifth generation Torres Strait family, enjoying the 'Garrison Town' tour of Thursday Island and the 'In Their Steps' tour of Horn Island. Revel in the Torres Strait Heritage Museum, with its displays of pearling, Torres Strait culture, myths and legends, and World War Two in the area. The museum is the largest and most comprehensive collection of its kind in Torres Strait and a perfect accompaniment to the tours. Various packages are available. The 'Garrison Town' tour is a small group encounter that leads guests through all the best Thursday Island has to offer, from scenic to historical, cultural to heritage, all in the comfort of an air conditioned bus with an entertaining, and informative guide. The 'In Their Steps' tour of Horn Island is a small group experience, an emotive and enlightening journey, allowing guests to explore the most advanced operational Australian airbase during the Second World War. They walk in the veteran's steps, exploring their sites, all while listening to a perfectly balanced commentary between archival records and actual veteran's stories. The 'In Their Steps' tour of Horn Island is a small group experience, an emotive and enlightening journey, allowing guests to explore traditional Horn Island and the most advanced operational Australian airbase during the Second World War, the Japanese' second biggest target in Australia. 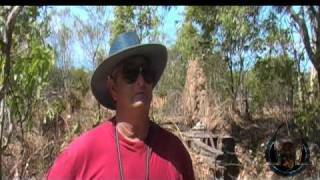 You walk in the veteran and Torres Strait Islander's steps, exploring slit trenches, gun emplacements, underground command post, wartime aircraft wrecks, taxiways and dispersal bays. The exploration is enjoyed while listening to a perfectly balanced commentary between archival records, actual veteran's memories and traditional stories. The guides are a fifth generation Torres Strait family from Horn Island who are passionate about their home and its wartime and traditional history. The tour is complimented by a visit to the Torres Strait Heritage Museum, the largest collection of its kind in the Far North. The curators of the museum are your Horn Island tour guides. A sumptuous buffet lunch is provided as part of the 'In Their Steps' tour package. The 'Garrison Town' tour is a small group encounter that leads guests through Thursday Island's rich multicultural history, from Bipotaim (Before Time), through to the dynamic culture of Thursday Island today. You will enjoy all the best Thursday Island has to offer, from scenic to historical, cultural to heritage, all in the comfort of an air conditioned bus with an entertaining, and informative guide, who is a fifth generation Torres Strait family. The tour will visit the historic Thursday Island cemetery, Thursday Island Township, historic buildings, including churches and hotels, the wharf areas, Green Hill and the Green Hill Fort and museum. Your guide's comprehensive commentary is a perfect balance between archival records, traditional and local stories, providing a compelling journey through Thursday Island history.